40% of participants said they felt pressure to eat unhealthy. A recent report by Cancer Research UK claims young people who are exposed to just one extra junk food TV advert per week consume up to 18,000 extra calories every year. The study found that teenagers recalled seeing an average of six TV adverts for foods high in fat, sugar or salt (HFSS) across a seven-day period. The latter were found to consume a significantly higher amount of junk food over the course of a year. A total 3,348 UK participants aged 11 to 19 years old were surveyed during the study. It comes amid growing calls for tougher restrictions on junk food advertising in the UK to tackle the country's obesity crisis. 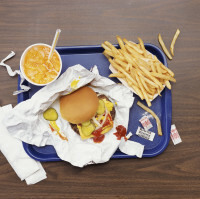 The researchers found seeing seven junk food broadcast adverts per week, instead of the average of six, was linked with consumption of an additional 60 HFSS items every year. This equates to estimated extra 342 calories per week - almost 18,000 extra a year. Participants who were obese reported watching one extra HFSS advert every week, the researchers added, as well as admitting to consuming an average of 30 HFSS items per week, including crisps, biscuits and fizzy drinks, but only 16 portions of fruit or vegetables. The researchers estimate this amount of HFSS makes up between 30 to 40% of their weekly guideline amount. Around 40% of participants said they felt pressure to eat unhealthily, a figure which rose to 52% among participants who were obese. Cancer Research UK said: "the most effective mechanism" to help curb junk food eating would be a 9pm watershed on the content of TV adverts. "The food industry wouldn't pump hundreds of millions into advertising their products by creating catchy adverts if it didn't get people to eat more," the authors said. "Broadcast regulations in the UK haven't been updated since 2008, and our research shows that the current restrictions clearly aren't working. "With today's teens spending more time in front of screens than any other activity apart from sleeping, curbing exposure to junk food ads on streaming platforms as well as TV will be key to helping teens make healthy diet choices and reducing obesity rates." A previous study by Cancer Research UK found that young people watch between 20 and 26 hours of TV per week. Chief executive of the Advertising Association Stephen Woodfood said: "Although we have amongst the strictest rules in the world on HFSS advertising to under 16s, it is important to note that we are not complacent to the public health problem or the role advertising can play in helping tackle it." Getting ready for your annual family holiday? Don't forget to get the appropriate insurance package you need for your trip.